Offering a carefully chosen selection of plays from the ancient Greeks to the present — including many new contemporary prize-winners — The Compact Bedford Introduction to Drama has the plays you want to teach and the features students need at a compact size and an affordable price. Twenty-eight chronologically arranged plays are illuminated by insightful commentaries and casebooks that enrich students’ contextual understanding and encourage critical thinking. Concise introductions for each historical period and play emphasize theater design, staging, and acting style, and a wealth of photographs and illustrations help students visualize plays in performance. A fresh new design highlights the contextual features and additional help for students including a guide to writing about drama, a glossary, and new cross-references to a robust companion Web site. 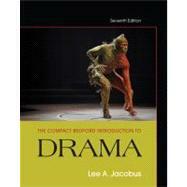 Lee A. Jacobus is professor emeritus of English at the University of Connecticut and the author/editor of popular English and drama textbooks, among them the full and compact versions of The Bedford Introduction to Drama, Sixth Edition (Bedford/St. Martin's, 2009); and The Longman Anthology of American Drama. He has written scholarly books on Paradise Lost, on the works of John Cleveland, and on the works of Shakespeare, including Shakespeare and the Dialectic of Certainty. He is also a playwright and author of fiction. Two of his plays — Fair Warning and Long Division — were produced in New York by the American Theater of Actors, and Dance Therapy, three one-act plays, was produced in New York at Where Eagles Dare Theatre. He has recently written a book of short stories, Volcanic Jesus, which is set in Hawaii. *Roger Asselineau, "The Quest for God in Desire Under the Elms"
Arthur Miller, From "The American Theater"
What Is the Purpose of a Review?